I have wanted to try Magic Cake in the Instant pot since I saw the recipe on SparklesToSprinkles. Magic cake has 3 layers of yummy goodness, sponge cake, custard, and fudge. The great thing about this cake is you only need a few ingredients. 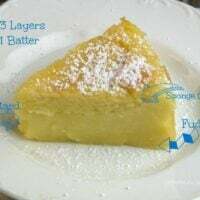 The batter is a little tricky to make you should watch the video on SparklesToSprinkles to get it right and you can bake it right in your Instant pot or pressure cooker. My Apple Bread with salted Caramel is another great recipe to try in the instant pot. Directions: For the Batter, I suggest seeing the video on SparklesToSprinkles. Pour into your 7″ springform pan. The batter will come right to the top. Place 1 cup of water in the bottom of your pressure cooker. Create a sling with foil and lower onto your trivet. loosely cover pan with foil. Place pot on Manual High pressure for 40 minutes. Do a quick release. Remove and allow to cool. sprinkle with powdered sugar. For the Batter, I suggest seeing the video on SparklesToSprinkles. Place 1 cup of water in the bottom of your pressure cooker. Create a sling with foil and lower onto your trivet. loosely cover pan with foil. Place pot on Manual High pressure for 40 minutes. I didn’t have good results….. I only filled the spring form pan 3/4 full. I covered the top of the spring form pan with foil. I placed it on a trivet with 1 cup of water in the bottom of the IP. After the 40 minutes of cooking, I opened the IP to find the cake batter all over the inside of the IP. Only about 1″ of cake remained in the spring form pan. The cake tasted great but what a mess. I would say the flaw was in your springform not the recipe. However, I’ve not made the recipe yet. Could you have had a leak in the bottom of your pan? Happened to me just before we put it in. We chanced it. Although there’s uncooked stiff in the water., the cake looks fine – so far. 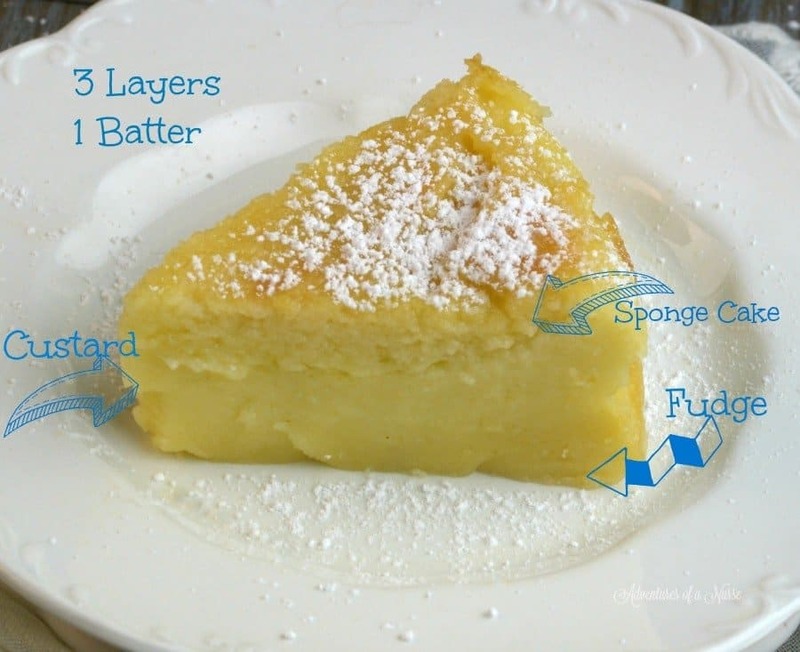 I’m wondering if anyone has tried different flavorings with this cake and I’d so which ones and how did they turn out? Can’t wait to be trying this out! Magic cake is the best! I have an 8 quart and an 8″ pan, would I increase ingredients by 1 1/2 or 2 times to accommodate larger pan? I have seen both on cheesecakes and haven’t had my long enough to know yet. What happened when the above person did this in her springform pan and it ran over and all about? Want to make this, but don’t want to have the same problem. I have a 7 inch Nordicware pan and I’ve always had good luck with it. Any ideas? I made it and I cooked it for 40 mn just like the recipe said, but I don’t know if it’s done. It’s kind of wiggly. I can’t make out the different layers. Keep tasting it to see if it’s done or not. It’s got a form, but pretty soft. It’s the middle layer that puzzles me. Maybe it’s almost like rice pudding consistency in the middle. I put it in a springform pan lined with parchment. Covered the top with foil. Set it on a trivet. Any ideas as to future making of this cake. Maybe I should try one in the oven and see what the difference is. I made this last night and it was very good. I did have the same problem of my springform pan leaking so I poured it into a glass baking dish instead. After the 40 minutes I wondered too if it was done but as it cooled it set a bit more. 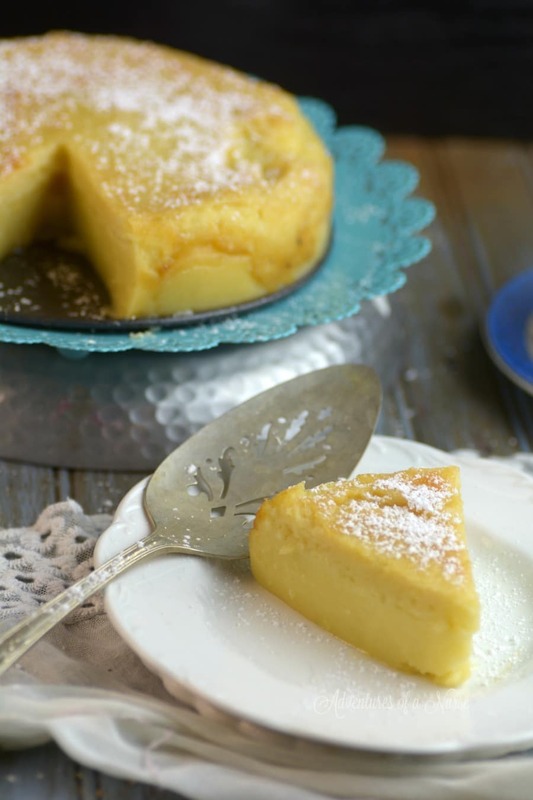 Very good recipe like a flan or custard consistency and I will for sure make it again. Any idea if I can use turbinado sugar or does it need to be white sugar? We don’t use white sugar anymore. I see cups water. 1 cup into IP. Does the 2nd cup go into batter? Sparkles video does not show. Thank you. I have never heard of magic cake but decided to try this anyway, sounded good. It did not look done after 40 min so I did another 20, and then another 10…I had a gooey layer at the bottom of my pot under the trivet, must’ve leaked from the springform pan. But the cake was good. I was very surprised to find it tastes exactly like a Finnish pancake and texture is very similar as well. So to me it tasted like breakfast, although I think it was enjoyable as a dessert. Would be great with some fruit flavored topping. I made it. I didn’t really get the “magic” effect of the 3 layers. Because it’s not too sweet, I renamed it my “European Dessert” rather than cake, since we North Americans tend to think of cake as super sweet and rich. The flavor was good. Just made this cake following all the directions, but after 40 mins in the instant pot it was still loose batter- I’m putting it back in for 15 mins…. I made the cake following the directions. When I put it in my 7″ springform pan it ran out all over my counter as it was very runny. I went back to recipe and it said to watch the video of SparklesToSprinkles. The video does NOT show adding the 2 cups of lukewarm milk. I made it again omitting the milk and it turned out pretty good in my instant pot. I tried to make your magic cake twice. The batter was so thin the 1st leaked out the bottom. I ended up putting it in the oven, used the wrong pan size so I don’t know if it will come. Plus I really couldn’t fold the egg whites. I didn’t realize they were suppose to float on top during baking. Please help me figure out what to try next.